Readers of my weekly column in the Waterttown Daily Times, and no doubt you Big Hungries right here as well, are acquainted with my general disdain for restaurant dishes made entirely from processed items from the food service truck rather than from scratch. There are several reasons for this aversion, but the most important one is that, in 99 percent of cases, cooking that begins with fresh, whole ingredients just tastes better. But this is a new year, and we should be honest with each other, don't you think? I have a confession: there are a few food service processed products that I quite like. 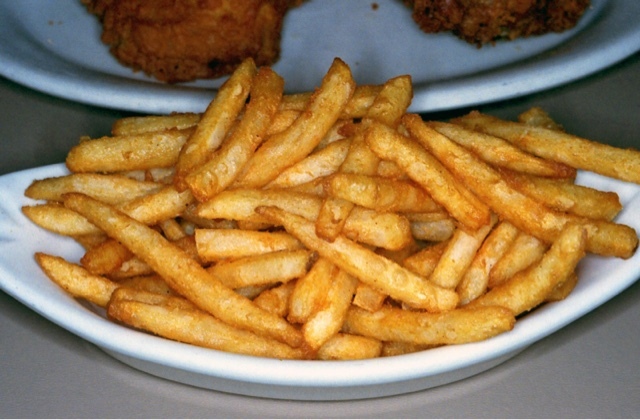 In college, the SUNY Geneseo food service dept was very fond of serving "Brew City" fries, which are allegedly a beer battered frozen fry. 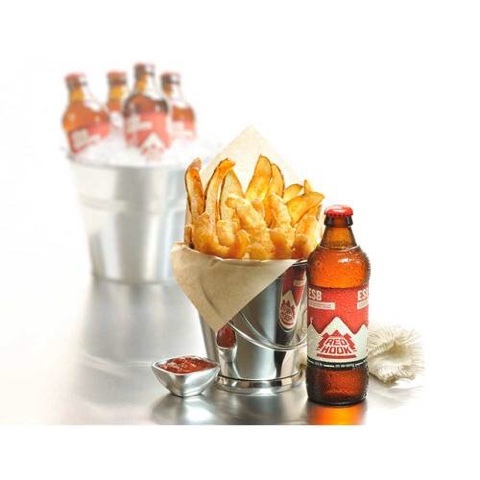 In no way do these fries seem beer battered to me, mind you. There is no lightly crunchy, airy, beer-flavored coating on them. But they are crispier than conventional frozen fries, and more flavorful, too. And they remind me of tuna melts and carefree times on that campus with friends. If I have to consume a frozen French fry, this is my choice. Also in my college days, I worked at the Chesapeake Bagel Bakery in Watertown during school breaks. We made a surprising amount of the food served there from scratch, including the bagels and the heavenly cream cheese frosting, but our soups were frozen Campbell's, mixed with water and simply heated up. The broccoli cheese was surprisingly good, and I used to love a cup of it with a pesto bagel toasted and smeared with garlic butter for my lunch during a shift. 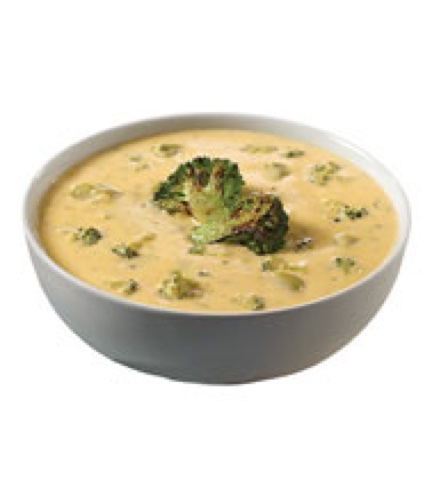 It wasn't the best broccoli cheese soup I've ever had, but the cheddar flavor in it was good, and through some alchemy of food science, the broccoli was never totally overcooked in it. When I first moved to the Southern Tier, the guys who had previously run the Vestal Steakhouse briefly opened a really great place in the old farmhouse just over the bridge between Vestal and Endicott. They had my favorite ever version of escargot there, dressed with Gorgonzola cheese sauce instead of garlic butter and herbs. I once asked for the recipe, and they informed me that the sauce was straight from Mains Food Service. Thud. That sauce was supremely savory with just a hint of sweetness to take the edge off the umami funk of the blue cheese. It was also fabulous with a well-caramelized ribeye steak. Mm. My final confession is available today from Art's Jug, in Watertown. I order them every time I go: Red Hook Ale Shrimp. These are pure junk food of the highest order: the beer batter on these babies is legit, with sweetness that echoes the sweetness of the shrimp, which stay juicy due to their protective batter blanket. A squeeze of lemon counters the sweet, and I can eat an entire order on my own, if allowed. They are seriously delicous. I want them right now. Well, I feel better now that I've gotten that off my chest! Do you have any New Years food confessions to share? Stay tuned this month for a review of a soul food spot in Binghmaton, a new online food purveyor I'm digging, and more! And as always, my Watertown Daily Times reviews continue every Sunday,a don I'll be here with you on Wednesdays. My personality is big; my hunger is bigger! Ho Ho Ho, Hungries! Santa Shelby's here to confer invisible awards on my favorite foods from around New York State. While my blog travels with me all over the world (coming in 2016: Singapore! ), my home and my heart belong to Upstate New York. It's only right to take a look back at some of the best bites of the year from the family-owned eateries north of The City and congratulate them for creating excellent eats and sharing them with the masses. 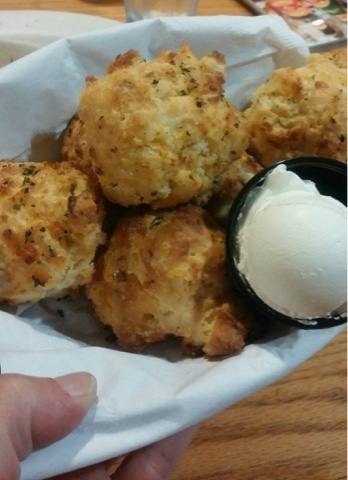 Without further ado, let's talk about appetizers. I loved the baked onion at Riccardo's in Watertown, because sweet onion plus rich cream heaped onto crusty bread is pretty much my simplistic version of edible Heaven. I also adore the smoke bombs at Food and Fire BBQ in Johnson City: jalapeños stuffed with cooling cheese and wrapped in thick bacon, smoked and swiped with sweet BBQ sauce? That is an exciting and tasty bite that is a test for the taste buds. But my 2015 Best Appetizer, the thing I've craved ever since I first had it, is the fried mozzarella at Adams Country Club in Adams. This was not a mere mozzarella stick, people. 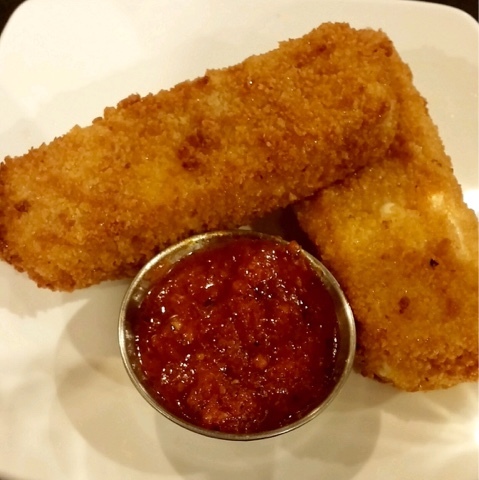 We're talking about a plank, like big enough for a pirate to walk, of gooey, oozy, creamy melted cheese encased in flavored breadcrumbs and served with chunky, bright, herbal marinara sauce. Sometimes I just find myself daydreaming about this delicious indulgence in the middle of the day. After appetizers come salads, and I'm awarding two outstanding ones this year. I can do that, because it's my blog and my awards and I do what I want. Also because one of them was a one night only deal at a wine dinner, while the other should still be available if you want to go get it. The first of the two Best Salads of 2015 is the hearts of palm salad at P.S. Restaurant's Cinco de Mayo wine dinner, which was a concerto on a plate: what vegetables aspire to be. 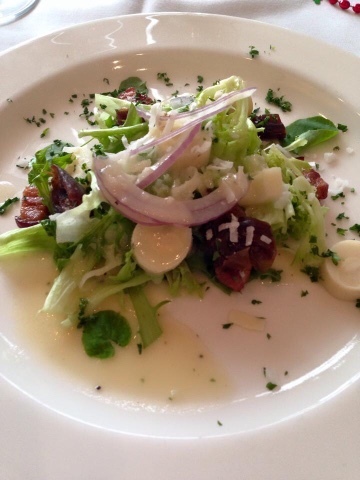 Tender, mildly acidic hearts of palm with salty lardon and crunchy greens bathed in a sweet coconut vinaigrette. It made my heart sing, and I wish Rick would add it to the regular menu! The second launched my new obsession with Caesar salads. 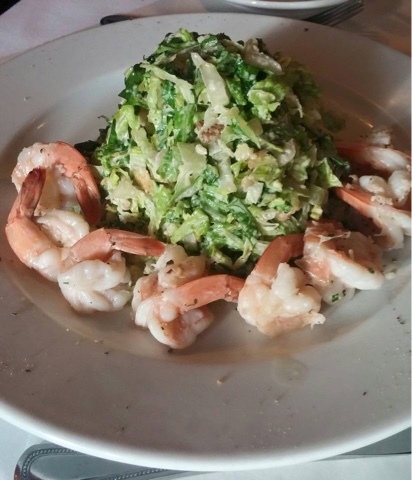 The other Best Salad of 2015 is the Caesar salad with shrimp at 1844 House up in Potsdam. The execution of this salad was flawless: ribbons of tender, young romaine and tiny cubes of crouton perfectly enrobed in the most luxurious blend of egg yolk, Parmesan cheese, anchovy and extra virgin olive oil I have ever tasted. I'm now making my own version at home, but I'm struggling to find the balance this dressing achieved. It was surrounded by succulent, garlic-infused shrimp, which I find to be the perfect accompaniment to this cold, rich salad. You guys know I have a thing for bacon. Maybe that's an understatement, but please stop judging me. It's not nice! I loved the bacon braised collard greens that came with my fried chicken at the Tailwater Resort, near Pulaski, but the 2015 Best Bacon was at Maestro's in Saratoga Springs. 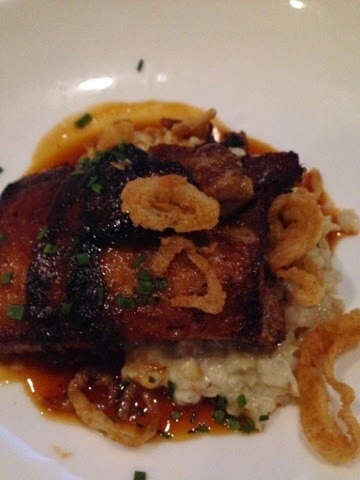 Maestro's pork belly with barley risotto and crispy fried onions was unctuous, savory, earthy and utterly luxurious. Tailwater is the bridesmaid again in the race for best side dish. That place's onion rings were the bomb, and you should make your way to Altmar ASAP for a plate of them. But the winner of Best Side Dish of 2015 is the roasted Brussels sprouts from Citrea in Binghamton, because not only did I love them, I hear from other people all the time that they do as well. These sprouts are nutty, caramelized so that all their sweetness develops fully, and just salty enough to counter the sugary woodsiness brought out in the brick oven. 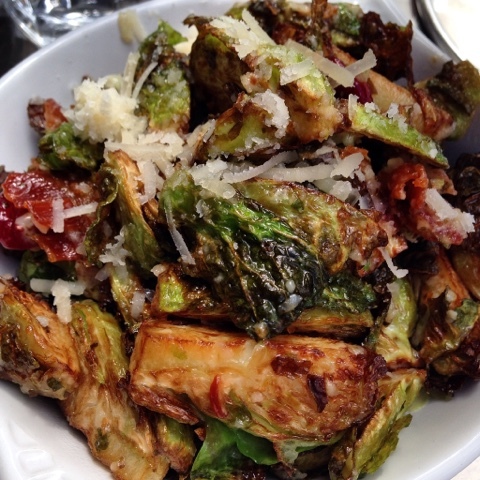 They are a must-order at Citrea, and could make even a vegetable-hater into a Brussls sprout aficionado. One of the best entrees I had in 2015 was of course at Hattie's in Saratoga Springs. Hattie's fried chicken is crunchy, well-seasoned, juicy, and just spicy enough to keep things interesting. 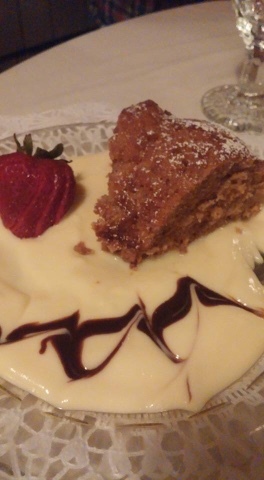 But the Best Entree of 2015 was found at Tony R's Steakhouse in Corning. Not only was the Delmonico steak at Tony's mouth-wateringly juicy, perfectly seasoned and exceptionally flavoful, but this restaurant brought together service and ambiance at an equal level. 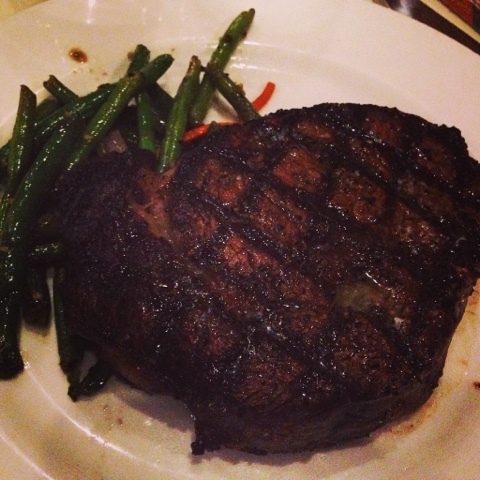 Everything we ate at Tony R's was terrific, but that steak was phenomenal. Sometimes I get complaints from the readers of my Sunday column in the Watertown Daily Times that I review breakfast places too often. I don't expect the masses to remember that I don't live up there, so when I am in town, I have to capitalize on my time and eat every meal out. I wish food writing could be my full time job, but I'm just not there yet! But because of all those reviews, I have eaten a LOT of good breakfasts/brunches this year. I wanted to give the best brunch award to The Kitchen, because our brunch there in August was simply extraordinary, but it's closed due to some hiccups with permits and the like, so I kind of feel awarding it is futile for you all, despite the excellence of the cinnamon buns, hangover soup, banana pancakes and brisket hash there. 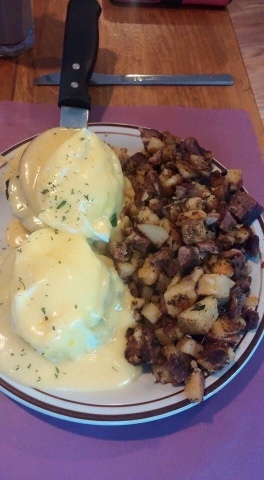 But my affection for the 2015 Best Breakfast is just as deep: it's the Nu Pier in Sackets Harbor. This unassuming roadhouse has been on the scene for decades, but right now, it's breakfast game is on fire. 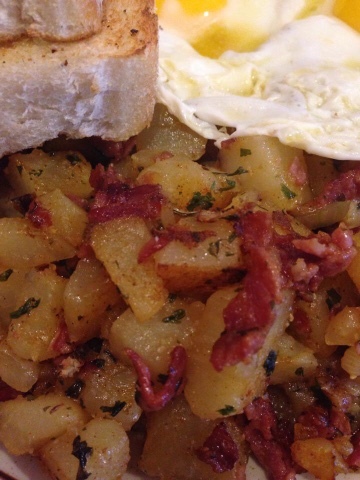 Go to the Nu Pier for the fluffiest, most tender and flavorful pancakes around and stay for the slamming corned beef hash, made with chunks of delightfully briny corned beef and herbed, griddled potatoes. I always like to award a best surprise, because face it: sometimes local restaurants change our minds for the better. Once in awhile, a place you thought was just OK will come out with a dish that knocks your socks off, or you'll be dragged to a place you had written off, only to be pleasantly impressed by your meal. That was the case with my Best Surprise of 2015, Lampy's in Endicott. I had three bad experiences with service and food at Lampy's years ago and had simply taken it off my list of places to dine. 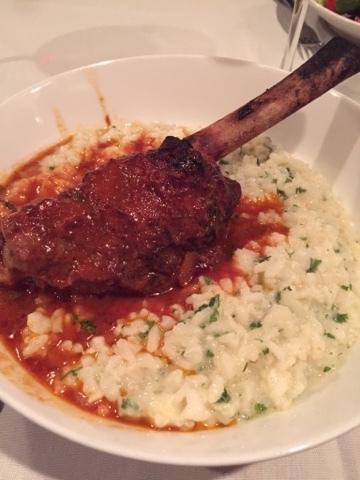 But a work dinner was planned there recently, and everything, from having two servers, to fantastic, spicy, garlicky pickles made by our waiter, to the absolutely flawless braised lamb shank over earthy, nutty Parmesan risotto that I had as my main, was great. I stand corrected, and I'm back to liking Lampy's! So, we're there, Hungries. At the end of the post and the end of the year, so I guess it's time to award the best restaurant. Like the other categories, I mulled over a couple really wonderful options for this award. Isn't that a positive dilemma? Eating in Upstate New York means such a variety of fabulous food, it's actually difficult to pick the best! The Kitchen may very well have been my choice were it still open - I was extremely impressed by the ambiance and world class cuisine served there. Let's give it an honorable mention. We also ate very well in Saratoga Springs in April, and several of those meals could have won. 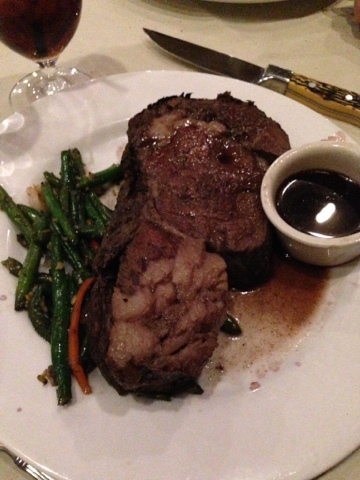 But my Best Restaurant of 2015 must go to Tony R's Steakhouse in Corning. Eating at this restaurant was an utterly transformative experience - this place could easily be successful in a number of world metropolises, but instead it's right on tiny Corning's main drag. The interior is plush, darkened, and sleek; the service is attentive and knowledgable, but not stuffy or pretentious; the food is...well, it's very, very good while still being entirely accessible to an Upstate crowd. The cuisine at Tony's isn't fancy, but the quality of ingredients is exceedingly high and the techniques used in preparation are on par with top restaurants in New York and LA. We're going back there next month for another epic meal, and I can't wait! So that's it, kids. The best of what's around, at least as far as this big mouth is concerned. I'm going to take a little break now from blogging, to enjoy the holidays with friends and family, and maybe revisits some of these awesome restaurants! Congratulations to all the winners, and thanks to every reader who has stuck around all year to see what I've been up to in my culinary tavels. May tidings of comfort and joy come to you, Hungries! Happy Holidays! As ever, my personality is big; my hunger is bigger! I’m a sucker for a happy ending. What Gen X girl isn’t? Unlike our jaded millennials and our pragmatic boomers, we ’70s and ’80s kids absolutely consumed fairy tales, from a mermaid filled with longing for a life on land to an intergalactic princess rescued by a maverick with a really fast spaceship. 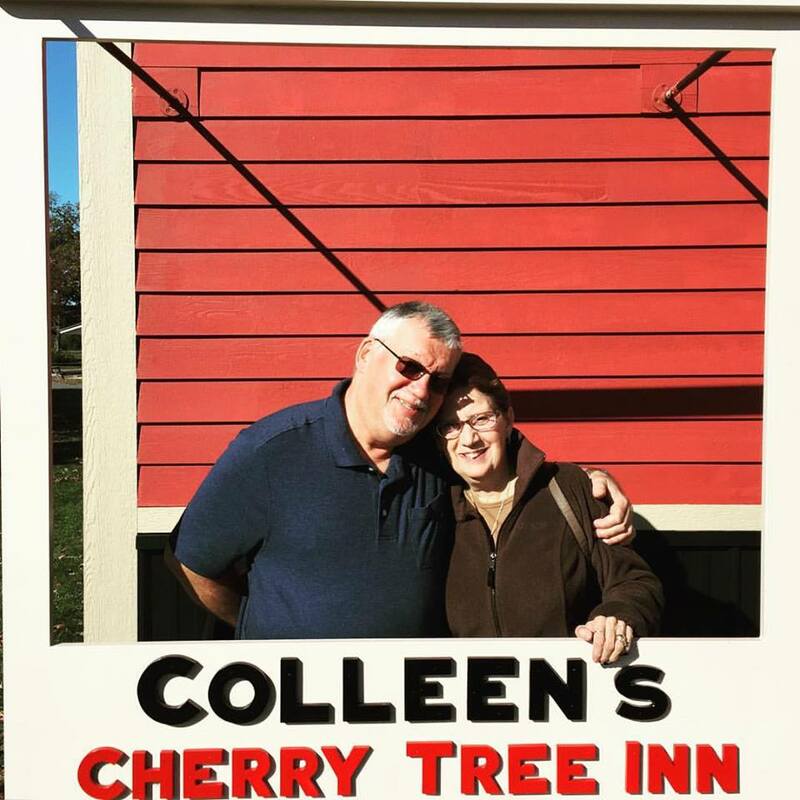 I am no less susceptible to stories like the one at Colleen’s Cherry Tree Inn in Henderson, bought in August by longtime managers Colleen and Michael Bellinger, a married couple who met while working there in high school. Awwww! I just had to try the place out for myself, and see if Colleen’s happy ending also ended with a good breakfast. 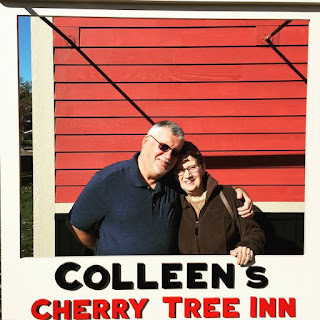 The Cherry Tree Inn has been wrapped up in welcoming red siding with a fun sign outside that’s shaped like an Instagram post, perfect for patrons to snap a pic and give the restaurant a bit of free advertising when they share it on social media. Inside, the adorable space is much bigger than it looks from the parking lot. A bustling crowd of casually dressed families and couples were tucking into big plates under the wood-paneled, vaulted ceiling on the Sunday morning we visited. 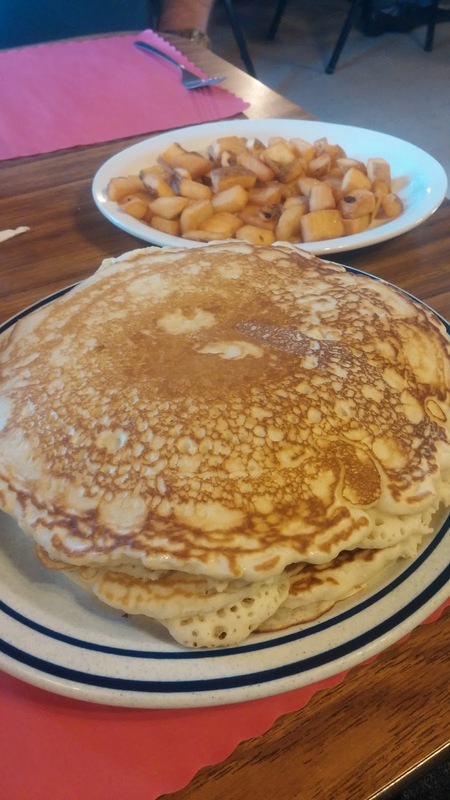 Our waitress, Deb, knew her menu well and offered expert advice on the finer points of breakfast potatoes, while providing us with frequent coffee refills. Deb is quick, good-natured and clearly a veteran — we liked her immediately. 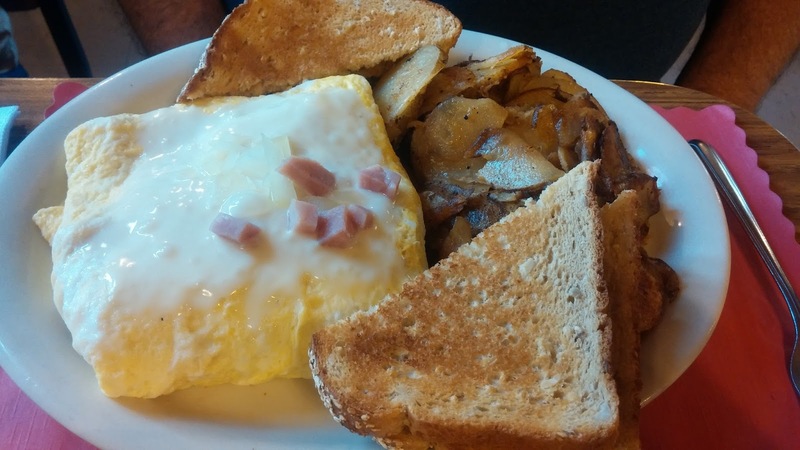 A ham, American cheese and onion omelet ($7.26) was cooked through perfectly without the egg getting tough. The ham and onions stuffed inside were plentiful but didn’t overpower the flavor of the eggs. A blanket of gooey, white, mild cheese kept its savory colleagues snug as a bug in a rug. Oatbread toast had heft and chew with a touch of sweetness, which was nice with all the savory flavors going on in this dish. Home fries, included with the omelet, were well seasoned and griddled brown, with good onion flavor and wonderful, crunchy/chewy texture. 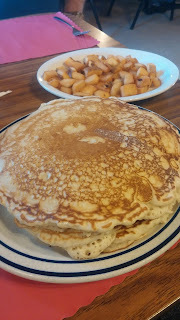 Colleen’s features two kinds of breakfast spuds, so we also ordered a side of country potatoes (show in pancake photo, below), a frozen food supplier’s diced potato product finished in the deep fryer. The cook at the Cherry Tree took care to season them well and not over-fry them. These are an entirely different creature from the griddled, sliced home fries — more lightly crispy than crunchy, with fluffy potato insides and more flavor from salt than from onions. 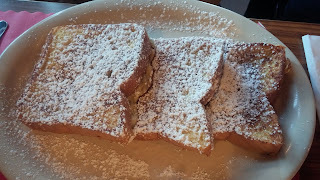 French toast was made with thick white bread dredged in an eggy, rather than milky, batter, so that the insides were airy but still luscious. Usually, powdered sugar on French toast is overkill, but this generous, snowy sprinkle added to the overall flavor. The batter wasn’t too sweet to begin with, so the sugary flourish at the end perfectly balanced each bite and worked with the syrup to achieve a harmonious bite. A side of bacon cooked crispy was more porky than salty or smoky. I know we’re prone to waxing poetic about salted, cured meats in this column, so I’ll leave you with: We liked it. Pancakes were plate-sized and nearly half an inch thick. These fluffy behemoths were highly absorbent, so real maple syrup would have added tremendously to this dish, but alas, we were served the imitation stuff. Insert sad noises here. The syrup kept absorbing completely into the cakes, leaving me tempted to pile on more butter instead. 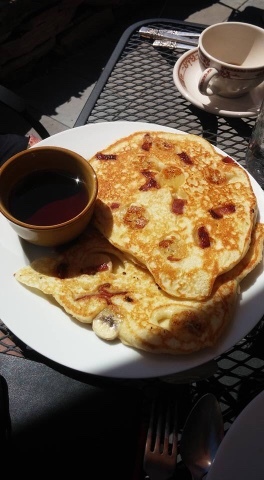 These hotcakes had a lot of promise and wonderful texture, but the flavor of the fake syrup soaking into the vast surface area of the flapjacks deterred from the overall dish. 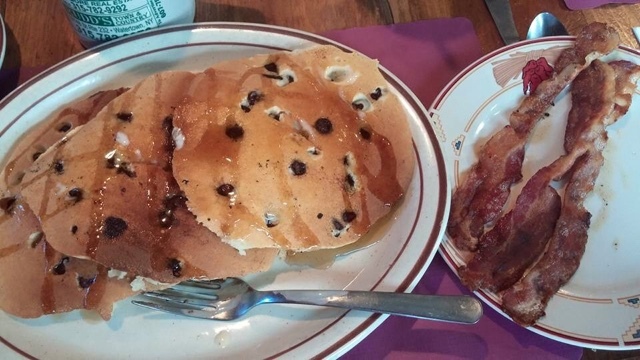 A colleague with a fishing camp in Sackets told me the Cherry Tree Inn has long been a favorite with his family and that he loves the breakfast specials on the weekends. 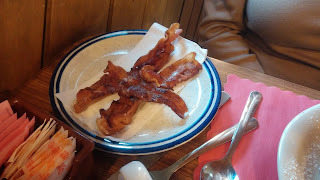 To be sure, it was tough for us to ignore the more creative treats available on the specials menu the morning we dined there. One of my editor’s few rules is that I be sure to review dishes that are available when readers stop by, so we avoided the yummy-sounding waffles and omelets — but I may have to drop by off the clock to sample these items. My favorite thing about breakfast at this busy, efficient eatery was watching diners from one table go over to another to greet and hug friends — the morning we visited, it was clear this was a locals’ choice hangout, and that convivial, hospitable atmosphere permeates even to newbies like us. Our breakfast totaled $36.70 for generous portions for three diners. I award Colleen’s Cherry Tree Inn a seven on the Big Hungry scale: well above average despite some deductions for food distributor potatoes and fake syrup. 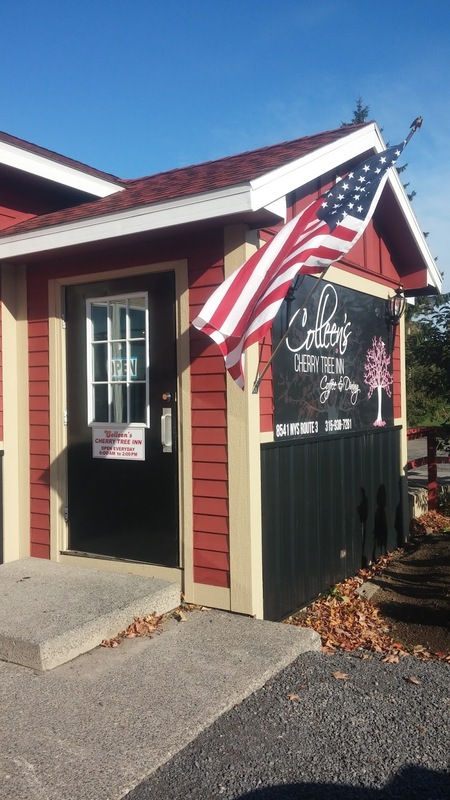 A recent Times article on Colleen’s revealed that a new menu is being unveiled soon, so I’m likely to revisit this cheery locale near Lake Ontario for another taste of this couple’s happy ending. When a fairy tale wraps up with a wonderful meal, it makes for a great story. A very quick trip to New England the week before last was filled with work, but also some pretty good food. 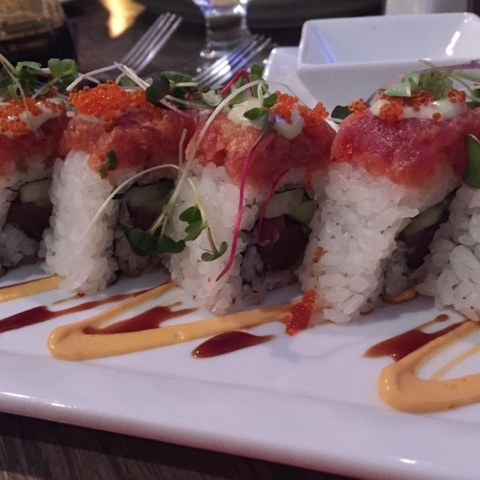 At Surf, on Nashua, NH's bustling, charming Main St., my colleagues were pleased with the seafood sandwiches and tacos while I received my fatty tuna (toro) fix with the cozy restaurant's ultimate tuna roll. Toro is the bacon of tuna. Ok, not really, as it's not cured or smoked; but it comes from the belly of the fish, and shares bacon's luscious, unctuous qualities. This massive roll employed the sweet toro with crunchy cucumber, sharp wasabi mayo, the pop of tobiko (fish eggs), and clean-tasting micro greens to very pleasing effect. 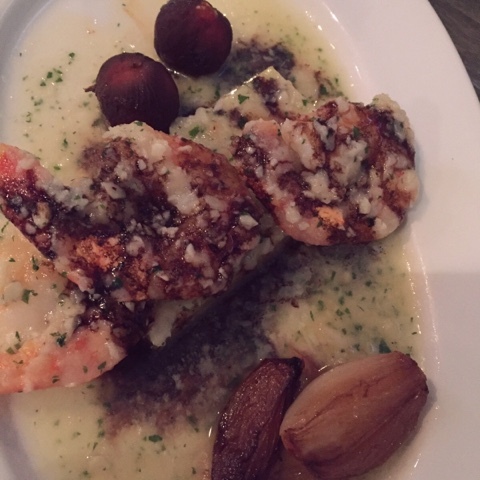 The garlic shrimp small plate was much different - lightly garlicky shrimp with a cake of firm, grilled yellow polenta, fresh rosemary, tomatoes roasted until almost dried in sweet balsamic vinegar, and a white wine butter sauce. This dish was savory, with lots of good umami flavors, and very homey. We sat in the bar for our dinner at Surf, and even there, the atmosphere was good. I'd love to return with reservations in order to sit in the dining room and enjoy. Our waitress had good recommendations and thought of everything to make our dinner memorable and delicious - a seven on the BHS scale! The next day, we stopped in Worcester, Massachusetts for lunch on the way back to New York. Often, an en route stop such as this means crappy fast food, but thanks to Zomato, my go-to resource for good food in strange locales, we found the Flying Rhino Cafe, on Shrewsbury St. This bright, colorful space became a new favorite for my two colleagues and me. Like fried pickles? Me too. 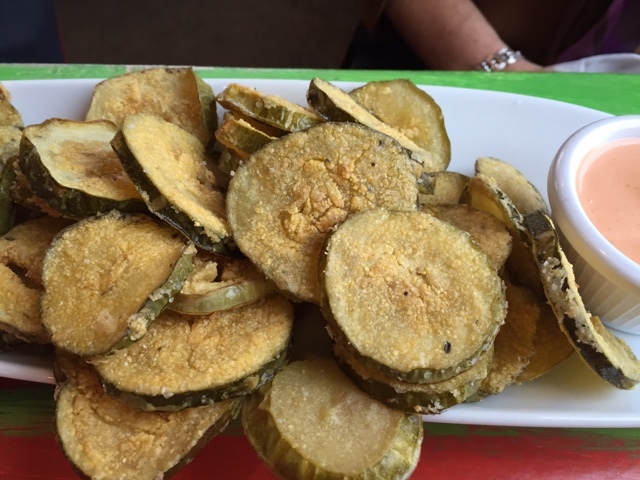 Typically in the North, you get dill spears, breaded with panko crumbs and fried, but these were thin, delicately dilled pickle chips, crusted in cornmeal and flour and then flash fried. The resulting fried pickles were crunchy, mild and absolutely addictive - because the breading and pickle were in balance, rather than a thick spear coated in a few breadcrumbs, I found these superior to most versions. Totally yummy. We also tried the buffalo chicken wontons, which were basically pierogies stuffed with chicken wing dip ingredients: shredded white meat chicken, cream cheese and hot sauce. Can you say yum! I can. Yum. I went for the Shorty's sandwich: shredded beef short rib with goat cheese, care elites onions, arugula and pickled tomato on brioche. So it had the salty, fatty, utterly tender meat and soft, sweet onions dancing with tangy, creamy cheese, the peppery bite of arugula and lightly pickled, acidic freshness of the tomatoes on a thick, buttery roll. Served with a pile of crispy Parmesan fries kissed ever so slightly with truffle oil, this was a decadent dish that was somehow refined for all its sloppy glory. I loved it. We did find the dining room a little loud at the Rhino - two tables very close to us were rather rowdy for lunchtime, but the noise didn't detract from the food one bit. I would gladly return here for the cafe's delightfully vivid decor and equally quirky spins on American cuisine. This place rates an eight on ye olde BHS scale. This was a very quick jaunt up to New England, and usually, this kind of hectic trip would mean rushed, junky meals a thruway stops. I'm so happy my colleagues had the patience to let me guide us to some new, fun spots to try out, and that both turned out to be so good. We'll be back to Surf and Flying Rhino on future trips for sure! My personality is big; my hunger is bigger! It's here! My annual gift guide for the foodies in your life, because it's finally time to eat all the turkey and gravy, then put on your stretchy pants and get out your credit cards. Rejoice! The holidays are upon us! My first two suggestions, I received for my birthday this year: two cookbooks from Staten Island, where we go annually for the Miss New York Pageant. First up, Nonna's House, a cookbook straight out of Enoteca Maria, my favorite Italian restaurant anywhere. 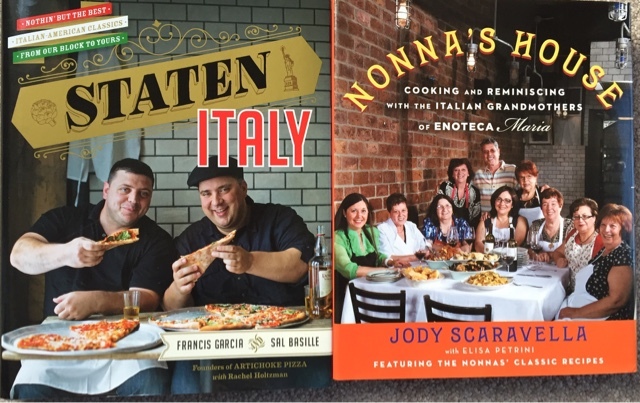 The book is filled with authentic, regional cuisine straight from the nonnas who rule the kitchen at Enoteca Maria. You won't find traditional Italian-American red sauce and meatballs here, but you will find lots of good eats. I personally can't wait to make Neapolitan potato pie, which is mashed potatoes mixed up with eggs, cheeses and cured meats and then baked with a breadcrumb topping. Yum. The second, Staten Italy, is a cookbook put out by the two guys who are the Pizza Cousins on Cooking Channel. 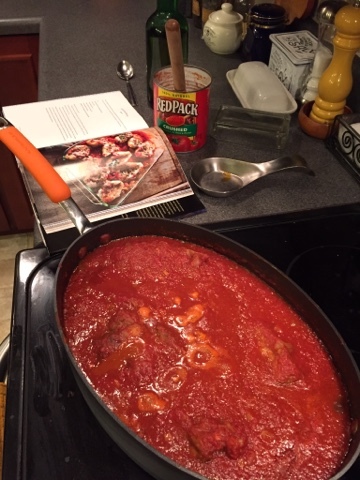 It has every old school, red sauce, comfort food Italian dish you could possibly want. 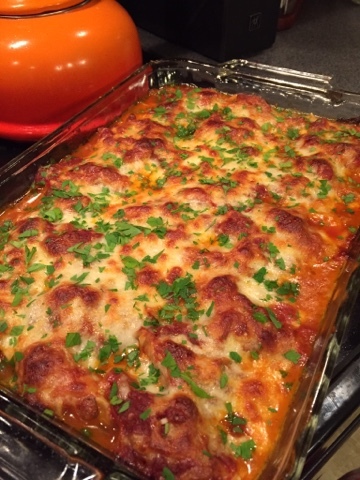 I recently churned out the Sunday sauce and stuffed shells from this book, and they were absolutely fabulous. You can find both of these at Amazon or in your local bookstore. Next up, two new favorite ingredients of mine, discovered in 2015. 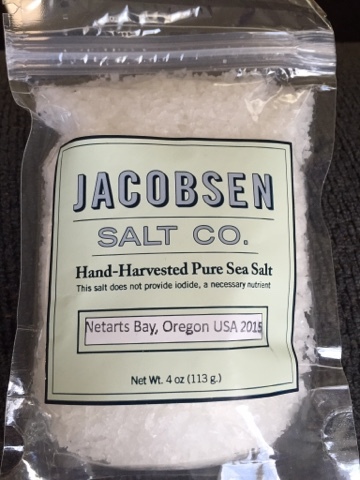 The first, retrieved on my recent trip to Portland, is Jacobsen Salt Co's sea salt. Inside this pouch, your loved one will find sizable flakes of oceanic, briny salt. Less sharp than table salt, but more robust than kosher, this tastes like the air near the sea tastes. It's wonderful as a finisher for roasted meats and seafood and really gorgeous on roasted veggies. The company is a small purveyor near Portland, so this is hipster artisanal product at its finest. Blue Hill at Stone Barns is purportedly one of the most incredible dining experiences in all of Upstate New York. I haven't succeeded in making it there yet for one of its famous three hour, multi-course dinners, but I did avail myself of the farm's internet shop earlier this year. 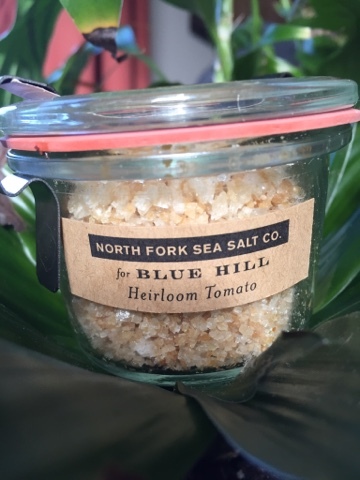 This tomato salt has grains a bit coarser than Jacobsen's flakes, but a more refined flavor, with less salinity. The tomato lends sweetness and the savory depth of tomato paste. I love this used in white rice, to give it personality, and also with avocado. It might seem odd to buy someone salt as a holiday gift, but I love to receive fun spices and ingredients as stocking stuffers, and I'm willing to bet your favorite foodie does, too. 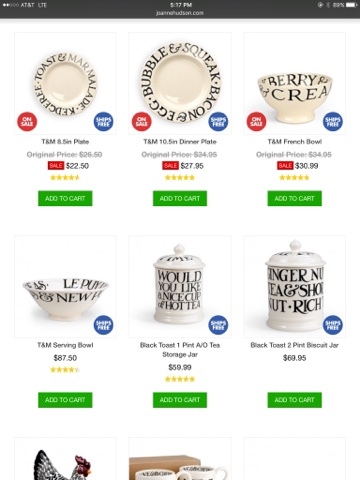 Keeping right on the housewares track, my handbag and jewelry fave, Kate Spade, has been making chic tableware for a while, but it's always been kind of higher priced. 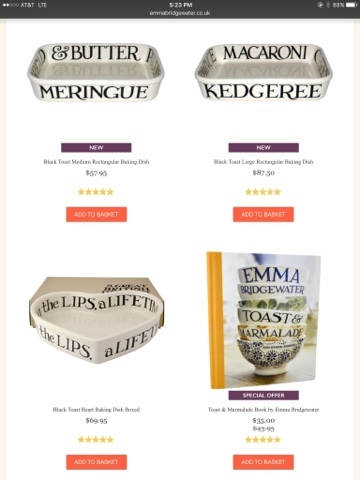 This year, the line has debuted some more affordable items, like melamine travel coffee mugs and feminine, fun coasters, plus kitschy kitchen towels, glam notecards and an adorable recipe book. Pick something like this up for the fancy ladies in your life, and don't worry about breaking the bank. 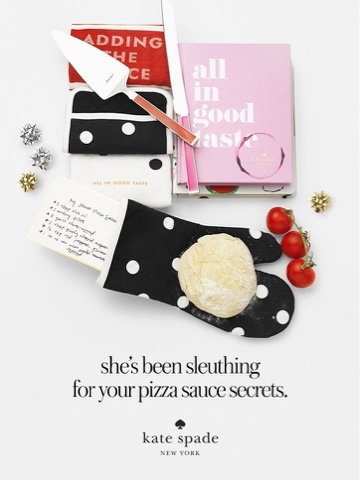 You can get them on Katespade.com and Macy's. In August, I reviewed The Kitchen in Alexandria Bay for my Watertown Daily Times column, and rediscovered French press coffee. The richness and consistency of French press coffee is far superior to any K-cup, but I realized that part of the problem with most press coffee pots is that the glass exterior lets the coffee get cold so quickly. 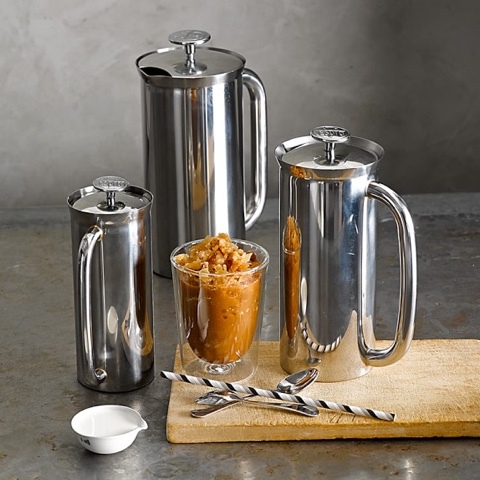 Enter the Espro French Press, available at Williams-Sonoma and Sur La Table, which has insulated side walls and stainless steel construction to retain heat. It also has a finer strainer than those cheapie versions, so you'll end up with less sediment in your cup. If you have a coffee aficionado on your list, this isn't the most economical option - it runs nearly $100 - but it may be just the ticket. This one's on my wish list this year! I've read this online magazine called Good. Food. Stories. for years. 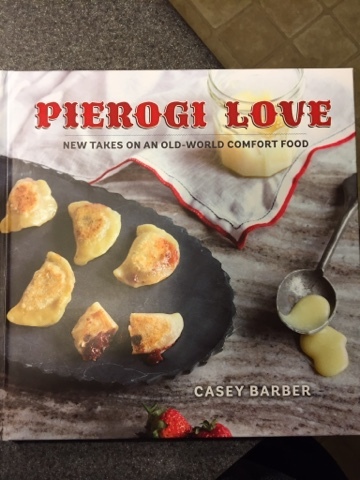 When its editor, Casey Barber, started mentioning that she was writing a whole cookbook solely on pierogies, I knew I had to have it. The master dough recipes are the keys to the whole book, and are super easy to create at home. 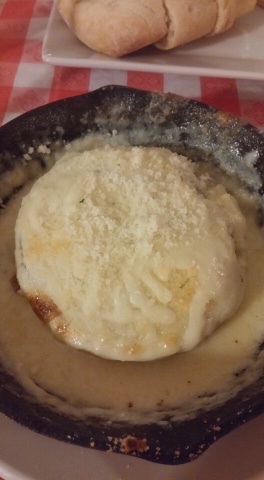 The next ones I'm making are the French onion soup pierogies, topped with crispy Parmesan frico. God, just writing about that makes me drool, you guys. I actually won this book from my friends at Go Fug Yourself, but you can grab a copy on Amazon. It's only $20! I don't go in for a ton of gadgets in my kitchen. A single set of tongs and a really good knife get me through most meal prep, you know? But Shawn and I do love pasta, and since I'm usually only cooking it for two, I hate to haul out a huge strainer every time. Plus, dumping all that starchy cooking water out before the dish is finished limits your ability to adjust your sauce with that salty liquid's magical thickening qualities. So I love my Joseph Joseph strainer scoop. 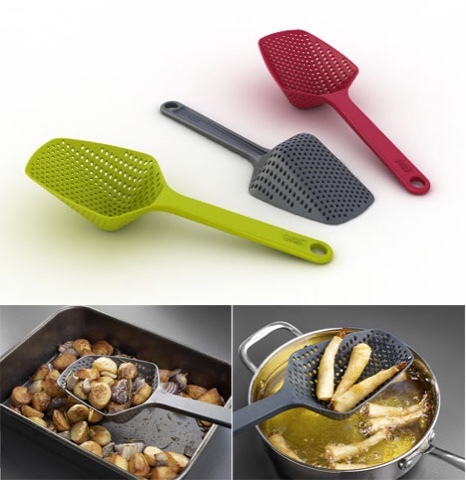 This hand-held colander scoops out sizeable portions of short cut pasta and lets you strain out the water without dumping it all before you're ready. I use this thing probably once a week, and it's $9. Coming to a stocking near you! I don't mean to be corny, but my final suggestion is to grab the foodie on your list and take him or her out for a meal before 2015 is over. When you do, hit up a locally owned restaurant, obviously. There is something primal and undeniably intimate about sharing a meal with someone, which is why generations of moms have insisted that you be home before dinner - it brings people closer. Moreover, the foodies in your life almost always get stuck with kitchen duty (we're good cooks!) so treating them to dinner out with you will likely mean some relaxation mixed in with the fellowship. More so than fancy salt or witty crockery, a meal out at a restaurant that will really turn your loved one on is probably the best gift you could possibly give. I wish that love and joy will come to you this holiday season, Hungries. In this, my fifth year as Big Hungry Shelby, I know that really good food plays one of the biggest roles in how people come together. May the magic of the season show up under your tree and on your plate! My personality is big, my hunger is bigger! A restaurant focused on seafood seems … unlikely to succeed in a landlocked locale like Norwood. I have this general rule about eating seafood solely near the shore. 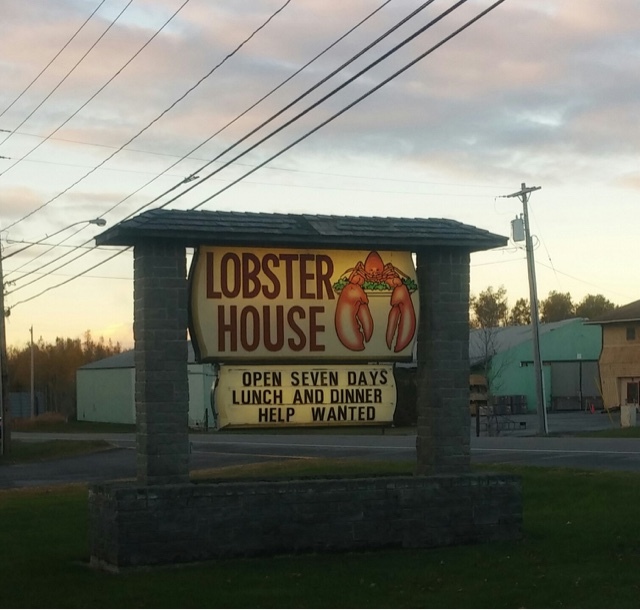 But on a recent visit to The Lobster House, about 100 cars clogged the parking lot of this north country institution that’s been cranking out hearty dinners since my parents were newlyweds. That's a good sign. Inside, despite the large dining room and hordes of guests, the space was restful, hushed and homey, with artwork depicting wintry scenery lining the pale green walls. Our party of five settled right into a circular table in the center of the action with a round of very reasonably priced cocktails and a basket of The Lobster House’s much-lauded cheesy biscuits, lightly crispy on the outside and tender and steamy on the inside — the tastier, more finely crafted cousin to the biscuits you may have had at a certain national seafood chain restaurant. 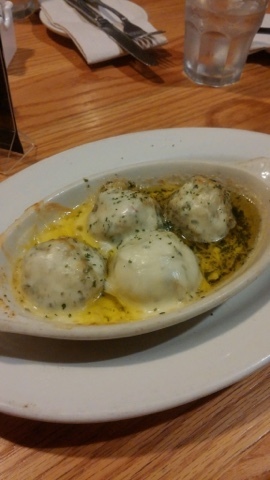 Stuffed mushrooms ($7.99) were positively jammed with a breadcrumb and crabmeat mixture and drenched in enough gooey, melted mozzarella cheese and garlic butter to make my more health-conscious readers blush. They were baked in that highly seasoned butter, to lift the earthy, woodsy mushrooms and sweet crab into a very decadent territory. 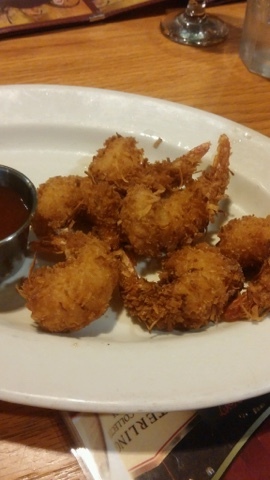 Coconut shrimp ($6.99) were large, plump and perfectly cooked, the shrimp sheltered inside deeply golden, sweet coconut shreds and served with a slightly sugary, slightly sour, fruity dipping sauce. Our waitress led us to believe these were battered in-house, which I can’t guarantee, but they certainly had more flavor than your typical frozen coconut shrimp — and dunked in the sauce, they were crowd-pleasers at our table. Clam chowder ($3.99 a cup) was deeply flavored and rich, the cream and fat brightened by celery and fresh parsley. One diner found it to be too salty and inferior to the lobster bisque ($3.50 a cup), which was quieter in flavor. I found that broth silky, creamy and accented by the zing of Old Bay spices, but with not much lobster running through it. I prefer bisque finished with sweet sherry, and this version was lacking that flavor, so the chowder won the day, for me. This is why I bring other mouths with me - everyone likes different things! Homemade dressing on a Caesar salad was a bit on the piquant side for me, with a squeeze too much of lemon juice and not enough egg and Parmesan in the mix. But the romaine was crisp, the croutons crunchy, and the diner who ordered it as his starter was pleased. Apparently, he can handle the sharpness of lemon juice better than I can. Shrimp scampi ($15.99) could have been as buttery and garlicky as the mushrooms, but instead I found this entrée surprisingly light, full of fresh, sweet shrimp flavor. The garlic butter sauce was plentiful but not heavy, and the sautéed veggies served with the shellfish were crisp-tender and well seasoned. A squeeze of lemon here was well placed and brightened up the flavors even more. 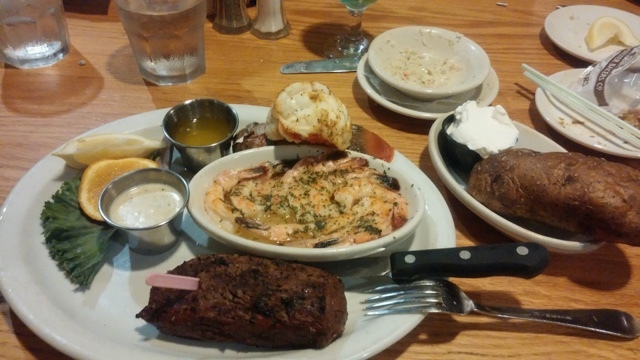 The same shrimp came with the Triple Play ($25.99), along with a tender, petite lobster tail and chateau tenderloin, a steak cut from the tenderloin filet of beef. It was cooked medium-rare and was perfectly juicy and very well seasoned — an uncommonly good steak for a combo platter and a very upscale trio of proteins for just $26. The Lobster House seems to be a place where hearty portions are doled out for fair prices, which may explain the packed parking lot. 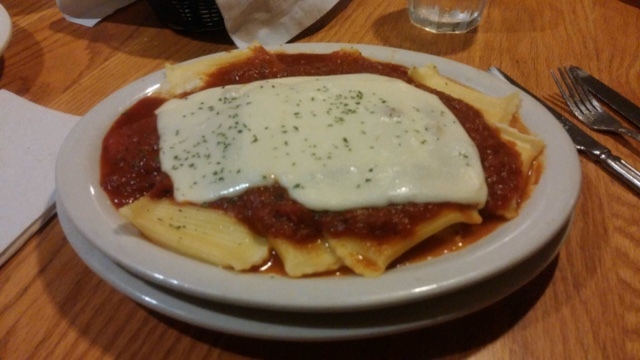 I was less enamored of the baked rigatoni ($13.99), which was an equally generous portion, but composed of those stuffed, frozen pasta shells crimped uniformly at the edges. You know the ones, they come in a bag from the dreaded food distributor. Plus, the cheese blanketing the top of this baked dish was not browned or bubbly — just a swath of white. I think we can all degree that when faced with topping a dish with cheese,browned and bubbly is the right going to do, yes? The pasta was cooked correctly and avoided being gummy, but I found both the tomato sauce and melted mozzarella to be bland. However, the diner who ordered this entrée loved it, describing the marinara as extremely tomato-y. Different strokes, you know? Again, this is why I bring friends to dinner! The maritime platter ($17.99) was bursting with seafood: fried clams and shrimp, plus scampi and broiled white fish. I found the clams tasty, with a burst of shellfish brine and a crunchy cornmeal coating, but the fried shrimp tasted like breading only — the shrimp flavor was completely lost in there. 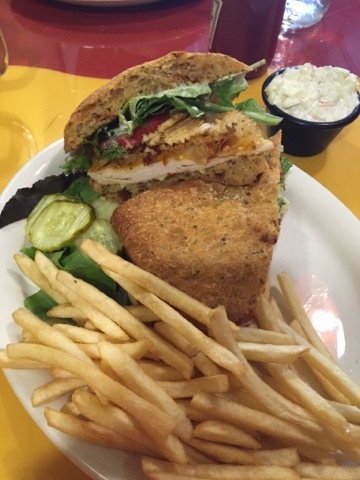 Again, the diner who ordered it loved everything, noting the flaky, fresh fish and the shrimp among her favorites. Maybe we were just an agreeable bunch that night. 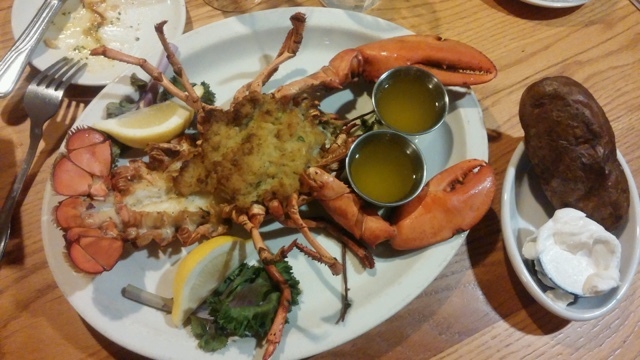 The stuffed lobster ($26.99) was a beautiful, whole-creature presentation splayed across my plate in majestic style. Before anything else, this thing was a feast for the eyes, and I don’t even mind putting that cliché down for you all to read. The crabmeat stuffing was redolent of celery, bell pepper and rich, sweet crabmeat, but there was almost too much of it — my palate wore out quickly from the sheer amount of this opulent dressing. The lobster itself was no slouch, weighing in at 1½ pounds and with lots of tail and claw meat, but it was just a tad overcooked and therefore really tough. It’s always a pretty good deal to eat lobster, but this could have been done a bit better. A baked potato served on the side was fluffy and cooked perfectly, dressed up with butter and sour cream, a delicious, tangy and earthy break from the heavy crab stuffing. Yeah, I get that a butter- and sour cream-laden spud should not qualify as a break from anything. Desserts were all straight from the food distributor, and we were full anyway, so we skipped this course in favor of heading south a half hour earlier. The crowd here was as varied as the menu: Everyone from date-night college students and very casual families to larger groups dressed up for a special occasion were tucking into the big plates from the big menu. One of the things I really liked about The Lobster House was the higher-end food served without the fuss of fine dining. No white tablecloths here — just grab a fork and dive in. I give The Lobster House an eight on the Big Hungry scale. While not every dish was executed absolutely perfectly, the value and portions make up that point, and our waitress, Ashley, brought it home with her attentive and good-natured service. I absolutely understand why this is a destination in St. Lawrence County. Any member of your party will find a dish on this menu. Indeed, we didn’t even manage to order one of the eight chicken dishes offered, and we barely made a dent in the pasta and beef entrees! Our dinner for five, with four adult beverages and two appetizers, totaled $154.89, a fraction of what it would have cost in just about any city in the country. 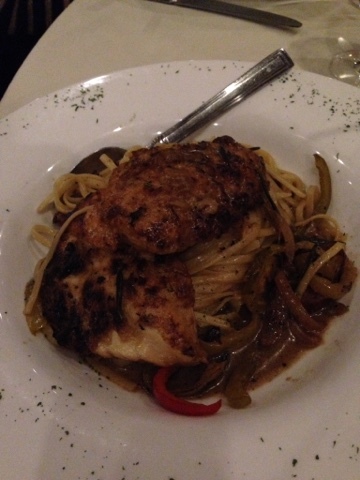 So head to Norwood and bring your appetite! The Lobster House may not be near the sea, but it has your seafood fix on lock. Landlock, you know? 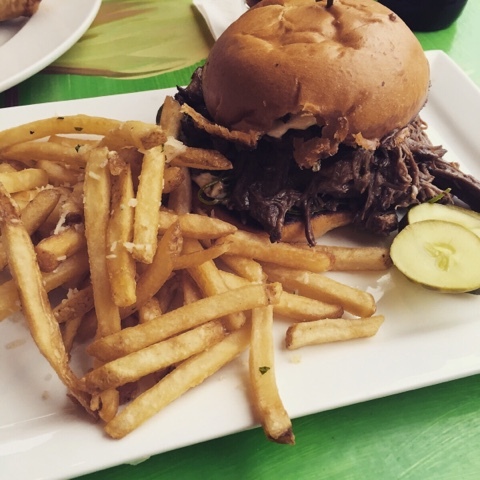 Are you following my eating exploits all over the interwebs? Join me on Instagram @BigHungryShelby and at that same handle on Twitter, and for even more content, join my Facebook group. It's called (you guessed it) Big Hungry Shelby! My personality is big; my hunger is bigger! People have been telling me to try restaurants in Afton for years. Here's the thing: I live near Owego. By the time I get to Bingamton, I've already traveled what seems like far enough for dinner. Why would I keep driving? But recently, Big Hungry Melinda was up for a food adventure and we both had a free Saturday, so we hopped on 88 and headed East. The Main Street Grill and Bakery is (duh) on Main St right in the heart of Afton. Right away, I was impressed by obvious effort made inside to create ambiance, with bold bistro colors of red, black, and gold dominating the two dining rooms. The soup on the day we visited was Italian chicken, which sounded right up my alley. The second fall switches on and the temps heads north, my cravings set to soup mode. This cup was well seasoned and vegetal. 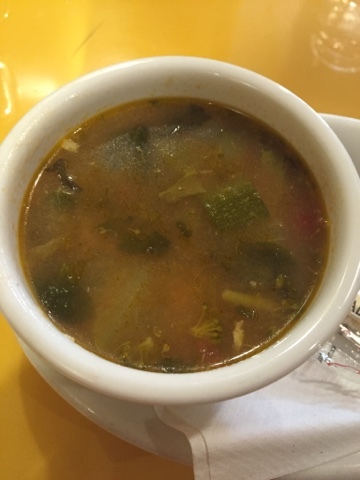 Chunks of zucchini, celery, broccoli florets, chicken and fresh spinach packed the broth, which had a subtle tomato flavor but not too much acidity or sweetness. There was also shredded white meat chicken and rice in the mix. Savory and satisfying. 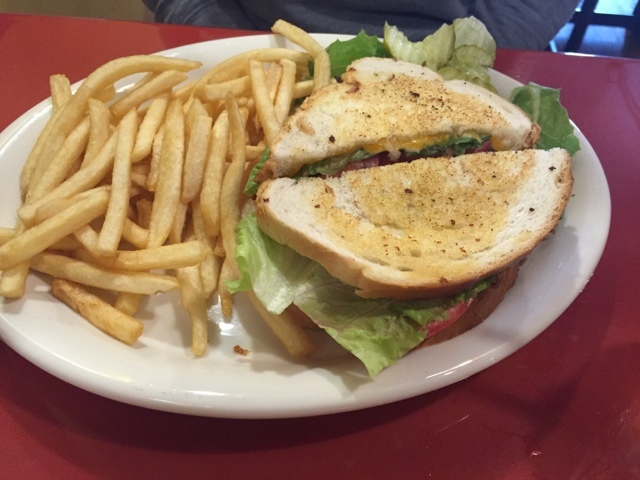 Melinda had the Main St melt - roast beef, bacon, and cheese with lettuce and tomato grilled up on buttered bread. The roast beef had good flavor, and we both appreciated that the bread was generously buttered to give it that crispy, greasy, slightly salty grilled cheesiness. But there wasn't quite enough cheese to make this a true grilled cheese, nor enough roast beef or bacon to make it particularly decadent in the meat category. I don't know if it's five years of food blogging under my belt that have ruined me for a simple sandwich or just plain gluttony, but I found this one a little boring. The French fries were thin and well-seasoned - like the ideal McDonald's fry. Not hand cut (a demerit), but tasty. I ordered the sandwich special of the day: loaded turkey. This delicious monstrosity was piled with deli turkey, bacon, cheddar cheese, caramelized onions, ranch dressing, and potato chips. Yeah. Crunchalicious! The ridged chips not only added great texture and heft to the works, but a salty edge that was tempered by the sweetness of the onion and the tang of the ranch. It was crafted on really good herbed focaccia bread that was soft and pillowy. Toasted bread would have been a little much with the chips, so I liked the focaccia with this particular combo of ingredients.This sandwich should be on the menu permanently - we both loved it. The dessert case at Main St Grille and Bakery is a pretty big deal. Throughout our meal, we watched other parties get up to inspect the cakes and pies before they ordered their final courses. And I think every table indulged in dessert. 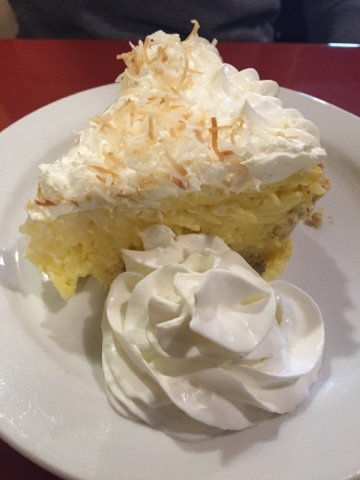 The coconut cream pie had a fantastic, tender crust studded with finely chopped walnuts and shredded coconut running throughout the vanilla custard. That custard filling was the perfect consistency, if you ask me - not gelatinous nor so thick as to be heavy - just creamy and flavorful. 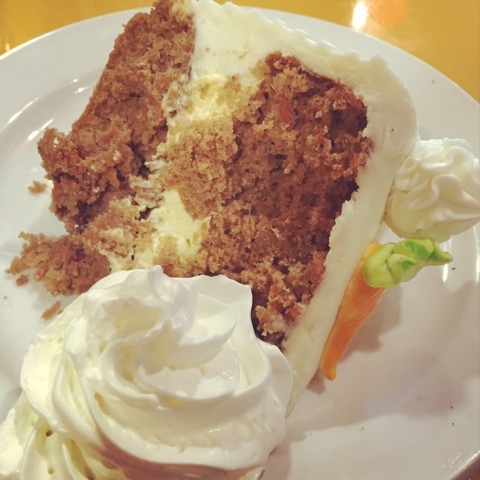 Carrot cake had a super sweet cream cheese frosting top with an absolutely delicious, robustly spicy cake base, dotted with plump golden raisins and dried cranberries, and a layer of vanilla pastry cream in the center. The frosting was a little overly sweet for me, but the cake was so strong, it kind of balanced everything out. I can't imagine what business would take you to the tiny town of Afton, but maybe lunch is enough of an excuse on its own? We really liked the Main Street Grill and Bakery, and I give it a seven on BHS scale - above average, but not quite stellar. A few minor upgrades (like hand cut fries) would propel this place, serving high quality food and hand crafted baked goods, into the stratosphere. I'll be judging and emceeing the Taste of South Jeff event this Saturday night in Adams. Info is on the Facebook page - come on out and see me while you support local restaurants! My personality is big; my hunger is bigger!